My daughter's birthday was last month and I made a strawberry swirl cheese cake for our church per her request. We had her friends come over and had a girls’ birthday lunch party. It was really fun to watch them play together. They took turns on her new pedicure spa, board games and her new bow and arrow game. Since it was just girls’ party my boys were busy playing their own games. I served them a spread of kid friendly meal which was suggested by my daughter and they watched a movie together at home and had some hot cocoa with a side of homemade popcorn. This was the first time I had the kids only party. I had fun making goodie bags with my daughter and it seemed like they all loved it. After the party my little one asked if he could have a boys’ only party for his friends on his birthday..lol!! I guess I have to do it for him now. I made this cake just for my family. So its a small cake just enough for us. Take a 7 inch spring form pan, line it with parchment paper and grease the sides using butter. Prepare the filling in the meantime by mixing the cream cheese in the bowl of a stand mixer or regular hand mixer. Mix it till it becomes were smooth. Add 1/2 cup of sugar and 1 1/2 tbsp. of all purpose flour to the cream cheese and mix well for 30 seconds on low speed. Now add 1/4 cup of sour cream and mix till combined. Scrape the sides in between for uniform mixing. Blend the topping ingredients in a blender or food processor till you get a smooth sauce like consistency. Drop small dots of the sauce in 2 concentric circles with one inch apart on top of the batter. Use a skewer to run through the dots to form marbled effect or swirls. Now lower the temperature to 250°F and set the timer for 30 minutes and cook till its done. 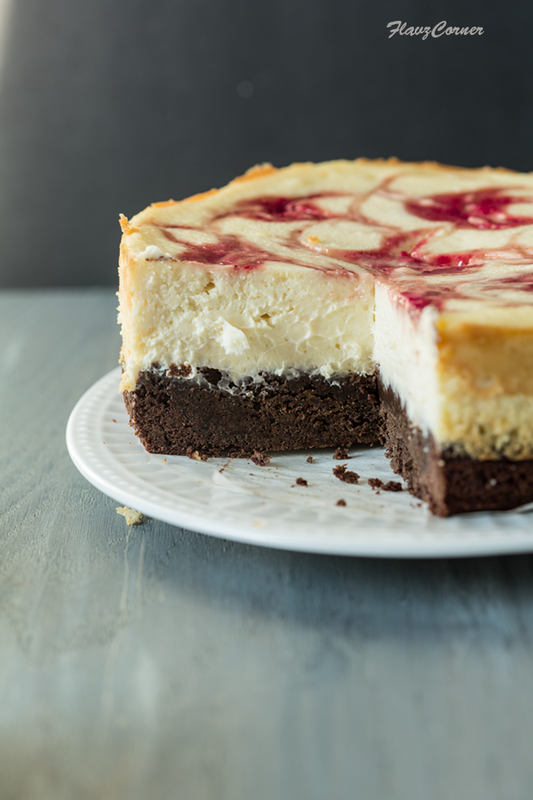 The chilled cheesecake can be easily released from the spring form pan and transferred to a cake stand. Slice them and enjoy! This is absolutely beautiful! 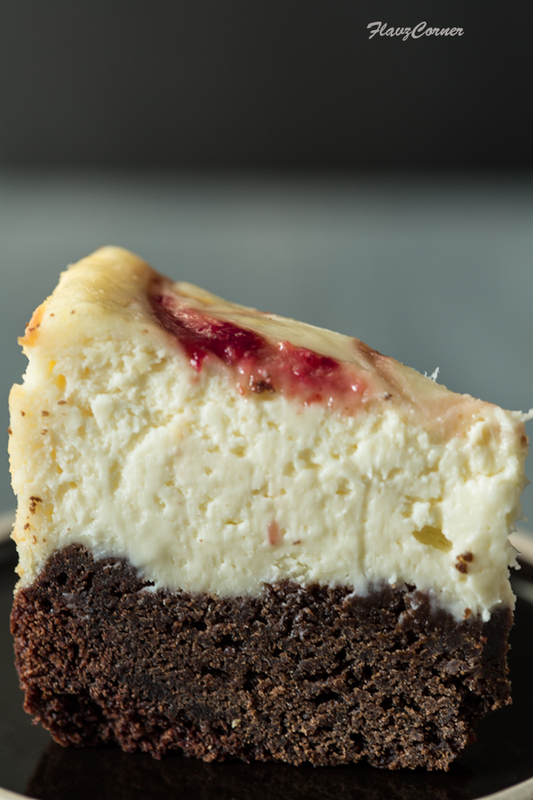 I love the texture and the colour contrast between chocolate bottom and cheesecake. Thanks Angie! 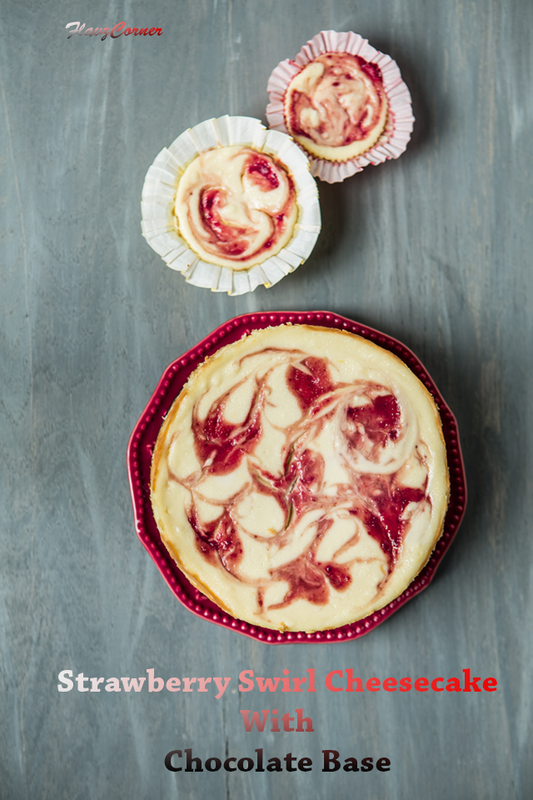 I love the contrast too, that's the highlight of this cheesecake. Thanks Rekha for the wishes and comment! I cannot say no to cheesecake either :). Thanks Rafeeda for the wishes! Now this looks so damn pretty! Besides being beautiful this cake might be delicious, a recipe to try for sure. Yummy! Belated birthday greetings to your daughter. God Bless. Cakes are my weakness. And this one remembers me of my birthday surprise given by aunt last month. Her love and affection is never ending. Dinner at one of the best venues in Chicago was superb. She ordered all my favorite food and sweets. Got gifts and blessings from all. Felt special!